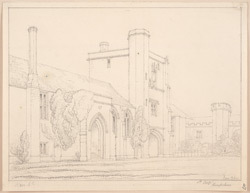 This delicate line drawing depicts the "Beaufort tower" at the Hospital of St. Cross in Winchester. St Cross was founded in 1136 by Henry of Blois for the service of 'poor men', a term which at that time referred to the elderly. The chapel forms the earliest part of the site, dating from 1160 and being Norman in style. The square, squat tower that can be seen in the drawing is known as the Beaufort tower, named after the Cardinal who built the superb complex of almshouses here in 1445. A wayfarer may still apply to St Cross for "the dole", a piece of bread accompanied by a portion of beer, served in a glass mug.